You. Avaliable on every smart phone. Anywhere in the world. 24/7. 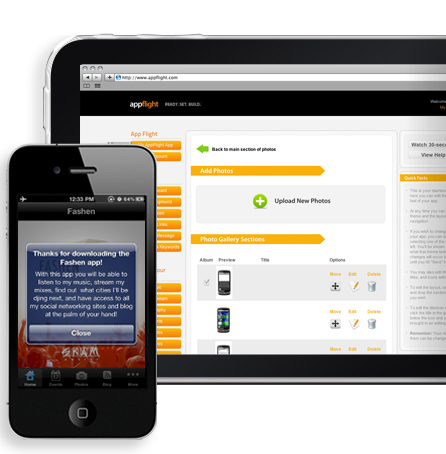 With appflight’s all-in-one mobile solution you can sit back and continue what you do best. We’ll take care of all the mobile stuff. No coding, just mouse clicks. Your app is always improving. The free 2.1 Platform Update brings an incredibly feature rich app. 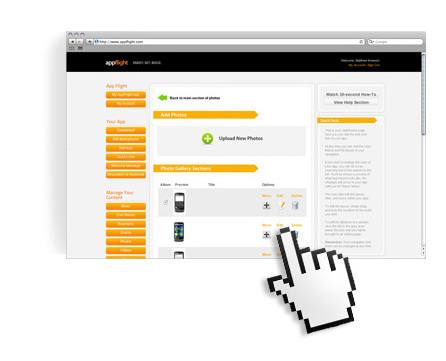 We've incorporated several core features and functions that are designed to create a more engaging mobile experience. We’ve set you up with drag and drop ordering. All you have to do is select the sections that you would like to include into your app and dag ‘em and drop ‘em in! 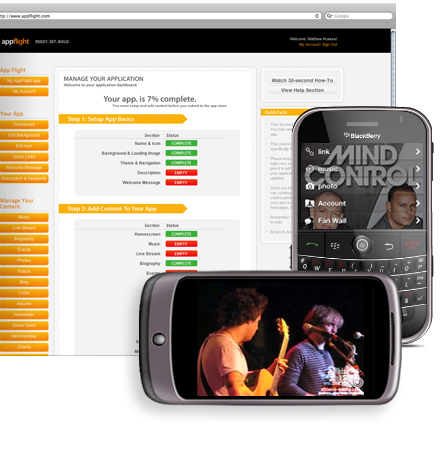 All of your app (doesn’t mattter wether its your Apple app, Android app, Blackberry app, or Mobile Web app) are controlled by one single web based control panel. You edit once and every app is updated. Add a photo, an event, change the theme, delete a section, etc... it all happens simultaniously. You don’t need to know any programming, or any crazy jargon. All you need to remember is your password! Theme theme theme Once you’ve chosen the sections youd like in your app... all you have to do is upload it in your control panel. We take care of the hassle of getting your app packaged, ready, and submitted to each app store. We also monitor review progress and act as your personal liason with review teams.